Are you a fan of black walnuts? The taste is decidedly different from English walnuts. Most people either love them or hate them. I think they’re an acquired taste. This fall has been a great one for foraging. It seems that everything is in abundance, including the black walnuts which we forage along a public trail. Gathering black walnuts is the easiest part of the process. When ready in the fall, the nuts will just fall to the ground. The husks will change from green to yellow when they are ripe. You can just pick them up from the ground, or use a Nut Wizard to gather them. Hulling (removing the husk) is also a relatively easy process, but be sure to wear gloves to protect your hands from being stained. Allow any husks that are still green to sit for a few days. Once yellow, or starting to turn black, they should peel right off. You want to hull when they are in the spongy stage; if the husks are allowed to dry out, the process will be much more difficult. If you are hulling a large amount of nuts, you may want to consider using something like this corn sheller, which supposedly works well for husking black walnuts. The hulls may be saved to use to make ink, or natural dye. I’ll include some links with instructions at the end of the post. 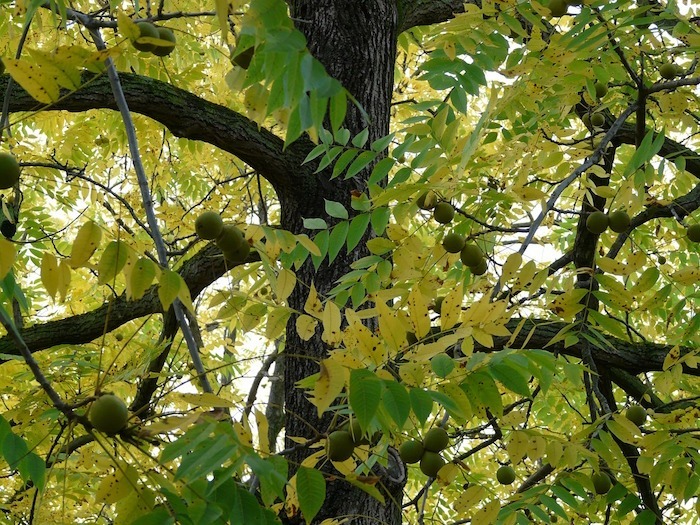 All parts of the black walnut contain juglone, a naturally occurring chemical which acts as an herbicide. The roots, especially, are high in juglone, and gardens should be never be planted near a black walnut tree. The juglone will break down during decomposition, but I prefer not to compost my husks or shells. I don’t want to take the chance that they have not thoroughly decomposed. After hulling, the nuts must be cured. When you first remove the husks, the nut will be a bit wet and slimy. Some people go through the trouble of washing them and removing every last bit of husk. I don’t bother. What I do is lay the nuts in a single layer on some cardboard (or screen) in a dry, ventilated area for about 2 weeks. I turn the nuts every few days to keep them from getting moldy. They will cure nicely and will no longer be slimy. And now we get to the fun part of black walnuts – cracking them. 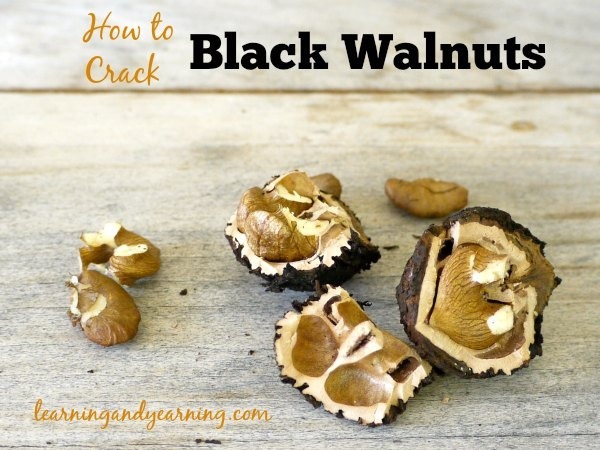 Black walnuts are notoriously difficult to crack, but with either the right tools, or a simple trick or two, the job can be performed without too much trouble. How you go about shelling your nuts will depend on how many nuts you have. If you have a lot, you may want to consider a heavy duty nut cracker like this one. If, on the other hand, you’re only cracking a few pounds of nuts, there’s a less expensive solution. You’ll want to be working on a sturdy workbench, or perhaps your garage floor. Place an old, but clean towel or t-shirt on your work surface, and place a nut on top of it. If you want to be really particular, place the nut with the pointy side down. Cracked in this position makes removing the nut meat easier and you’ll have larger pieces. Now fold the cloth over on top of the nut. This keeps the nut from flying all over the place. If you placed the nut pointed side down, you’ll have to arrange the cloth in a way that holds the nut in that position. Using a hammer, give the nut a good crack. Don’t go smashing it to smithereens, though. The goal is to just crack the nut in 2 – 3 pieces. You can now use a nut pick to remove the meat. Black walnuts will last up to a year in the refrigerator, or two years in the freezer. For digestibility, I recommend soaking and drying black walnuts before using in recipes. Here’s how: Place 1 c. black walnuts and 1 1/2 t. sea salt in a bowl and cover with room-temperature filtered water. Soak for 8 hours. Preheat oven to 150 degrees. Drain nuts and spread in one layer on a baking pan. Dry nuts in oven for 12 – 24 hours stirring occasionally, until very dry and crisp. A dehydrator may be used instead of an oven. This makes the nuts oh, so delicious. 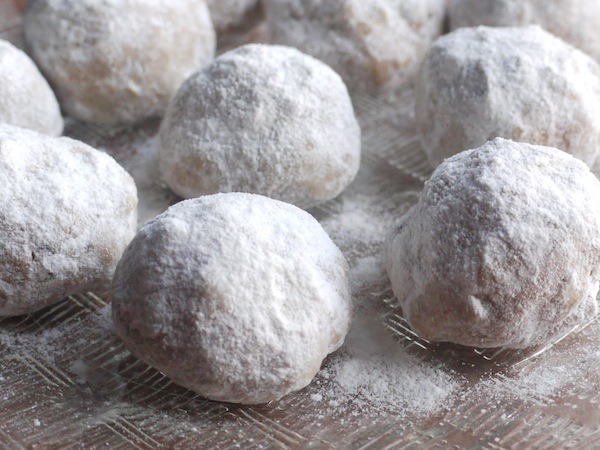 My favorite cookie ever, and my favorite way to use black walnuts is in Russian Tea Cookies. I use this recipe and just replace the English walnuts with black walnuts. And this Black Walnut Pie is to die for!!! Black Walnut Ice Cream from Janet at One Acre Farm. Did you know that you can tap black walnut trees for syrup? You sure can! Teri at Homestead Honey shows up how. 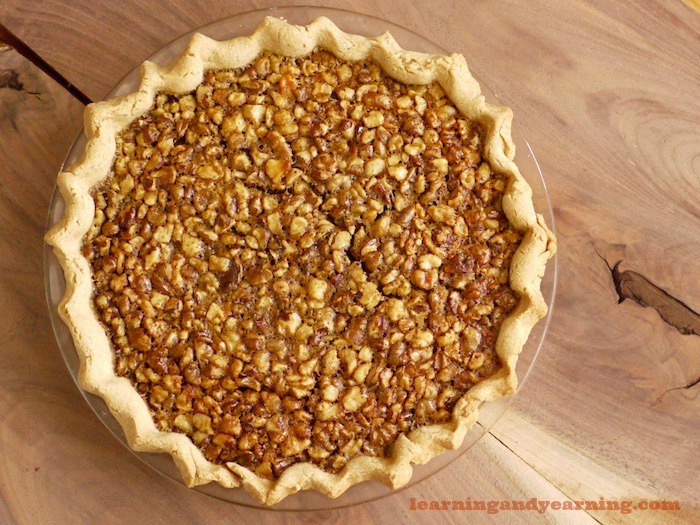 What ways have you used black walnuts? Do you love them or hate them? My parents have 2 black walnut trees and every year we pick up the walnuts and toss them in the woods for the squirrels. For a while there was a boy who would come get a bushel of the walnuts and sell them to a restaurant that uses all local foods. I have tried peeling and cracking them and found it to be too much work. Next year I’ll try your tips. I’ve aways wanted to use them. We used to put them in the gravel driveway then when cars ran over them, they would crack! Nice! We collected and cured our black walnuts for the first time this year, but haven’t cracked the majority of them yet. I’ll have to come back to give these recipes a shot! This post is VERY interesting to me. My dad has many black walnut trees. He planted them as a cheap way to grow a lot of trees when he bought his barren property 40 years ago. They are looked at as a nuisance…every fall involves several days of collecting the walnuts and piling them up at the back of the property. I’d love to help my dad actually find some ways to USE these! Thanks for an awesome, informative post. Andrea, there are companies online who sell black walnuts. I’d be inclined to check with them – they may want to purchase some of yours. I have almost a gallon of black walnuts still in the shells. I did not know much about them when I got them and when we went to crack one open the other day there was a mold covering the nut on the inside of the shell. I know its a long shot but is there ANY way to utilize them or clean them off and use them? I would hate to have all of those go to waste. Thanks. Hi Johanna, I personally wouldn’t use anything that has molded. Why don’t you try cracking more of them? Perhaps only a few have gone bad. Back walnuts have a green outer shell that has to be dried and then removed . Allow the inner nuts to dry, then crack and pick the nut meats out. Delicious in fudge, cakes. A lot of work & very expensive to buy & hard to find in stores ready to use. There’s absolutely NO NEED to dry the outer shell before removal! That only complicates the whole process by increasing the chances of mold & spoilage, and making the work of removing the hulls FAR more difficult & labor intensive. Nonetheless, it is still a lot of work?if done with some common sense, most of it is in the retrieval of the meat itself. I sell the washed and cured nuts as well as the hand picked out nutmeats. I have 30 trees about 30 years old I also sell ink/dye and an herbal tincture made with the hulls . Hull removal in the driveway works OK. I prefer a steel post tamper used to squash nuts where they grow. Then when I pick them up hulls generally fall away and leave hard nuts for my baskets. I dump hulled nuts in an electric cement mixer and water, let them run a while then dump them back in an open mesh basket or onto a chicken wire drying rack. Best way to crack hard dry nuts is place the pointed end down into a steel hex nut that fits a 5/8 inch bolt. 3/4 inch for bigger nuts. A good hammer whack breaks shell. Toss nuts, meat shell and all, into a paper bag and shake well. Pour everything out into a pie pan, pick out large quarters and halves, then go over chunks of shell for parts that need a nutpick. Slightly bent horseshoe nails work well for ready picks. Practice with the hammer will earn best whack strength to employ. For less effort and mess, hold walnut in hex nut together. Place them in a machinist vice and a quick turn of the handle closing vise’s jaws will crack nuts also. Man who taught me all this years ago put himself partly through college cracking walnuts. The vice is an excellent tool tried it today,Lowe daz have great gloves for picking and cleaning walnuts ,caled spider gloves 9.85 for 50 well worth it. An old timer told us that the black hulls off the walnut makes a beautiful stain! He said to just soak the black hulls in turpentine for a few days and strain into a jar. Well, even using gloves, my fingers are stained for weeks, so yes! Susan, use the blue nitrite gloves to avoid staining. It seeps right through rubber. I use layer of nitrite glove under neath big rubber gloves. I have my Raw product floating in water while I process them , removing the husks by hand at this point (looking for a manual crank corn husker) so I use the rubber gloves because they come up past my wrists. You may have read about this by now. Hi Oaty. We gathered many buckets of black walnuts last fall. Just like you, we wear nitrite gloves underneath thick rubber gloves. Keeps the hands and nails clean. My little town is surrounded by black walnut trees. About this time of year when a car runs over them it sounds like gunfire ! Hmmmm……lay them on the ground on an old blanket and run over them with a car ? Worth a try. I’ve never harvested them. Too much trouble. But, I love them I think cause I was raised eating them. Black walnut ice cream is my favorite way to eat them. After reading this I’ll try to process them. It would be a wonderful thing to put to use something that grows plentiful around me. Thanks ! Leatrice, I hope you give them a try! How many years does it take for black Walnut trees to start producing? I planted 3 in my yard 3 yrs ago. I also have a hazelnut or chestnut tree. Any information on the wait time for them to produce would be appreciated. Thanks. Jennifer, I believe that it’s at least 10 years! Check out arborday.org. 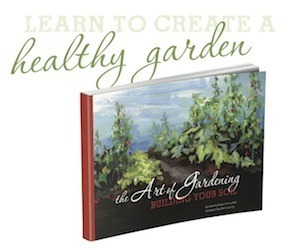 great info on all types of trees and plants. I’ve seen small trees produce, but they are not beneficial for the process you only get 1-5 and they are tiny with a malformed nut. Old trees are not hard to find if you’re in the region for B. Walnuts. I have one black walnut tree. I’m going to be making a tincture with the hulls. This will be my first time trying to do it. Have you ever tried this? Hulda Clarke wrote several books on this. That’s what first got my attention about black walnuts 20 years ago at least. 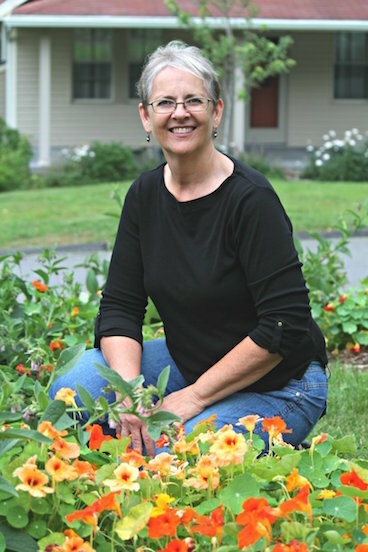 She claims it wards off cancer and actually helps cure cancer if one has the affliction. On top of a huge lifestyle change as well. Nothing is a magic bullet. Hi Rachel! Funny you should mention that; I was thinking of doing the same this year – and it will be my first time! I try to collect every other day, and process in small batches within a couple days. This helps me from being overwhelmed. I have one tree in my yard. My brother has 15+ trees. We go as a group to gather and hull these. I want to attempt making stain this year. Did not realize about the ink. ? Your idea and method is wise, Amie! I planted a Black Wallnut (3 m stock) and two years later it was producing Wallnuts. It has produced every year since (6th year). It does suffer from wind throw as it’s 1.5 m new growth is fairly brittle each year. The tree has split off its top twice due to weight. This year I have started pruning it back to 60 cm per branch. This spring we had a bad late frost that took out the plum, apple and cherry fruit. The top of the Wallnut was hit but the lower branches still produced about 100 nuts. I pick and hull them immediately with a butterknife. Just rim them and peel off the halfs . I don’t let them go black. I give them a quick wash in a large bucket of water. They do well drying in the fall air. To crack them I just use a hammer or if feeling adventurous a butterknife, regular nut cracker and small pick. I planted four nuts last year in the front yard. This year I have four 30 cm seedlings competing for space on the front lawn. I did hit one with the lawnmower but it has since put out a new side branch. Here is the best part. I live in Drumheller, Alberta, Canada. Yes, they can grow here too. You may have gotten fruit, but how many? I never see more than 5 and they tend to be underdeveloped on young trees, if any fruit. Sounds a bit of a tall tale. Pinning this. 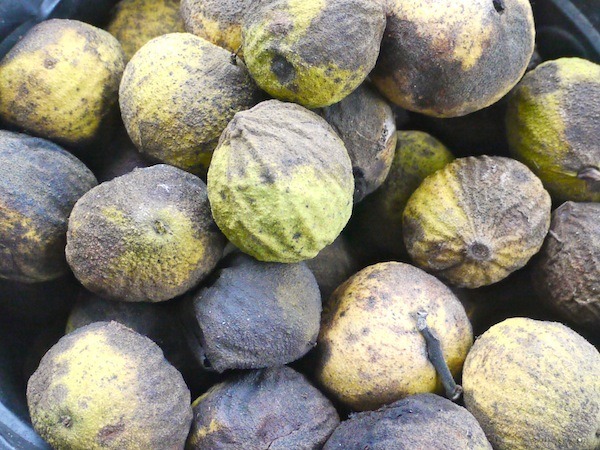 We have harvested black walnuts for the first time this year and I was looking for recipes. I usually keep black walnut flavoring on hand for an old-fashioned pumpkin bread recipe that we love. I love both the smell and the rich flavor of black walnuts. I live in the country in Kansas and have several black walnut trees. I pick the nuts when they fall and line my gravel driveway with them to hull them. Someone once told me to put the hulled nuts in a tub of water and the bad ones will float to the top. The squirrels hide some of the nuts and I have volunteer trees growing in a lot of strange places. I also heard you can’t plant under them but I have a shady garden with Hellebores, Holy basil, woodland phlox, ferns, and several kinds of bulbs that grow under three trees in my backyard so some plants will grow. I love the taste of black walnuts, when I was small we would go nut hunting in the woods to find them. My dad always cracked them for us and my mom baked with them. I use black walnuts. Slices. For pine needle baskets. So happy to find out what this is! I just moved to a new place and I have at least 3 of these trees right outside my house. I had no idea what they were, but a squirrel kept leaving them in the space between my windowsill and screen. at least in glass in a fridge. I have never experienced mould at least during that period of time. Hi Oaty, actually this process makes nuts more digestible, which means more nutrients are available. Yes, everyone’s taste buds vary, but I find them much more delicious this way. Thanks for stopping by! Hi Cameron, the curing process is necessary is you wish to store the nuts in their shells. They couldn’t be kept in a bag, for example, even for a week without this process. Yours should be just fine. My Grandmother would use black walnuts in a pound cake with a vanilla icing. My Mom would use them to make a black walnut taffy. My brother and I would butter up our hands so we could “pull” the taffy. I think we ate more than we pulled…. What wonderful memories, Ron! Thanks for stopping by, and for sharing with us. You put a smile on my face. Using a bench vice works much better and faster than hammer for me- just my two cents.